Engineers at natural gas liquids (NGL) fractionation processing facilities will find the dependable FLT93L ® Series FlexSwitch ™ from Fluid Components International (FCI) to be an effective and highly reliable solution for process relief valve leak monitoring in this demanding petrochemical process. NGL fractionation processing facilities separate ethane, propane, butane and other heavier hydrocarbons from the natural gas stream. Multiple trains and columns are used in this fractional distillation process, and the relief valves are critical safety protection devices. For the process to work efficiently and safely, the operation requires early and reliable indication when a relief valve leaks or lifts during an overpressure situation. 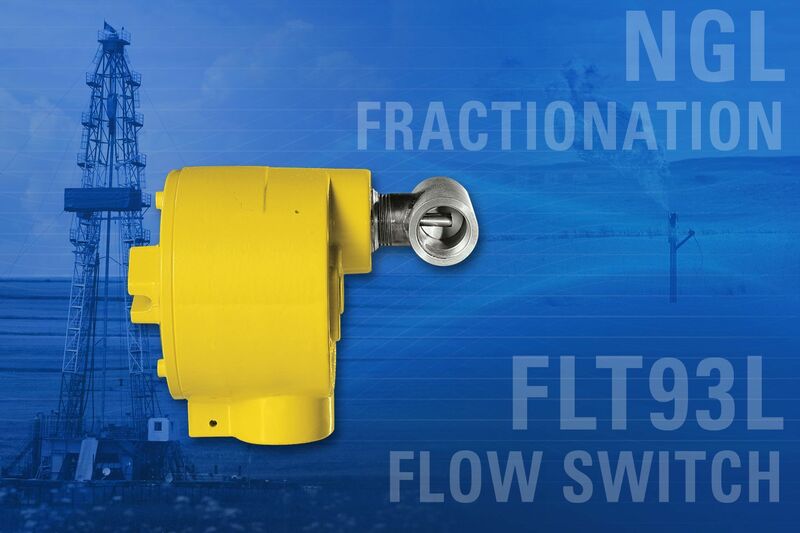 The FLT93L Switch accurately monitors the pressure relief valves for escaping flow with a thermal dispersion technology flow sensing switch/alarm. In this application, an inline configuration FLT93L is placed on 0.5- and 1-inch (DN15 and DN 25) diameter pipes. The FLT93L Switch detects leaking or seeping gas in the lines to alert the engineer to over pressurisation. It issues a programmed alarm during such events. For the system to work properly, the FLT93L must detect low flows and yet avoid issuing false alarms that could seriously impact plant operations. The FLT93L Switch offers a number of advantages at NGL facilities in overpressure monitoring. Not all gas flow sensing technologies are able to detect the required low levels of leaking or seeping gas, which can cause an overpressure event that puts plant safety at risk. The opposite situation also can occur where some alternative flow sensing technologies issue nuisance false alarms frequently, disrupting plant operations. For example, differential pressure (dP) and vane type technologies have been tried in this application with limited success. Problems have been experienced resulting from a lack of low flow detection, mechanical breakdowns, etc. Beyond accurate monitoring, the FLT93L Switch offers a number of other advantages in this application. It is easy to install and set-up: FCI’s voltage output allows user to see into the process and accurately set the desired trip point. Flexible dual relays are settable by the plant technician for any combination of flow and/or temperature alarms. FCI’s unique sensor technology combined with temperature compensation circuitry provides unparalleled performance capabilities: The FLT93L Switch’s flow accuracy is ±2% of the setpoint velocity over a ±28°C temperature range. Repeatability is ±0.5% reading. A wide selection of standard and custom process connections can be provided. The electronic control circuit can be integrally-mounted with the sensing element, or it can be located in a remote location. The standard enclosure is a coated aluminum alloy and is rated for NEMA Type 4X (IP67) environments. Global agency approvals for Ex installations are provided. It is SIL 2 rated for reliability.